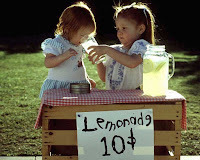 Back in elementary school, my BFF and tried at least three times to hold a lemonade stand on her street. To us, it was a great idea. She lived on a busy road in the town that led to the pool. We made signs, a great batch of cool, lemonade and sold it for a mere 10 cents. I guess if we were smarter, we would have realized that the speed limit was 35 mph and cars can’t make a quick stop on her street. No wonder our only customers were her neighbors. Regardless, as an adult, I love a good glass of lemonade. I think a wonderful addition to your next gathering is a grown-up lemonade stand. - Place a jar on the table for the coins!